Tonight begins a guided meditation journey of the Spirit and Grove of the Circle of Coll. ….the spirit of the tree you are with…. ….and our spirit’s life force with the tree…. The intention of our retreat in 2014 was to evoke the Spirit of the Circle of Coll (the Spirit of Coll) by working to discover the true nature of our seed group and how we can recognize the Spirit of Coll in others. As a working seed group of OBOD in the Seattle area, we have accomplished much, from providing public education, rituals and space for healing, to a recently developed prison ministry, but we realized this year that we had not yet properly acknowledged the Spirit that looks over our small gatherings throughout the year and guides us through our venerated undertakings. The venue that was selected as our weekend getaway was the Environmental Learning Center (ELC) at Sequim Bay State Park on the Washington State Peninsula. A two to three hour drive and ferry ride from Seattle, it was an idyllic refuge for anyone who sought a temporary escape from the business of the city and the craziness of the work week. The ELC had everything that a modern Pacific Northwest Druid could want: Cedars and Douglas Firs dominated the area that hugged the shore of Sequim Bay with plenty of space for quiet contemplation in the trees and the frequent chattering of the Stellers Jay and the brown forest squirrel. There was a pit for a community fire and ample grounds for tent camping as well as a profusion of conveniences such as heated cabins, Adirondack shelters, a sleeping loft, showers, a community kitchen and a meeting room. Our two and half day schedule was quite full and began Friday afternoon as attendees arrived to settle in and explore the grounds. We began with a ritual that we call ‘Beating the Bounds’ which brought all of us together in the North of the venue in the cool shade of the great ancestor Cedars. With drums and rattles, we solemnly processed sun-wise to the eastern most corner of the grounds where we thunderingly called for the Guardians of Air. Continuing on, marking the perimeter of our safe haven with our percussion and footsteps, we marched to the South to call upon the powers of Summer and the Midday Sun, then on to West and finally back to North, establishing a circular container and sacred space for the Elements and for us that was our home for the weekend. We would unwind the circle and release the Directions on the last day of the retreat. That evening, West Latta presented a discourse about the Foundations of Celtic Druidism inspired by his recent experiences in Ireland. This talk included a discussion about the topic of indigenous wisdom of Pagan Ireland and connection to Nature as the Supreme Being and to the Ancestral Spirits. In this workshop West introduced the Three Realms, the Three Cauldrons, the Celtic Cross of Light, an overview of an Irish ceremony and the importance of archeoastronomy in Celtic studies. We saluted the morning sun both Saturday and Sunday with a traditional Blessing of the Three Realms led by West, connecting to Sky, Sea, and Land followed by Gentle Druid Yoga generously provided by professional yoga instructor Katy Latta. A second workshop was delivered by Moss Magill entitled The Art of Intention: Bedrock of all Magic and Desired Outcome. This was an interactive exploration of intention in the context of magical workings, our Circle of Coll rituals, and in personal transformation, demystifying the magical power of intention and the ability to bring about desired outcomes. For the most part, our meals were improvisational with the exception of a grand potluck feast adeptly orchestrated by ‘Kitchen Druid’ Gary Sell. Where there are OBODies, there is usually a lot of exquisite food, and we definitely uphold the tradition here in Washington State! A worthwhile retreat could not be executed without the efforts of a hard-working team and we had one of the most effective task forces this year. Rich Ater and Randy Benham handling payments and attendance, Stef Warren organizing initiations, and Laura Wilson wrangling Eisteddfod performers were instrumental in pulling all the strings to operate this event. As usual, there was plenty of ritual at the retreat with Bardic and Ovate initiations, our Lughnasadh ceremony and a special rite developed and facilitated by Gail Colfax, Samantha Hudson, Michael Wurner, and Moss Magill designed to evoke the Spirit of Coll. Tree Spirit Whisperer 1 – Welcome along the path. Tree Spirit Whisperer 2 – Bring the sacred gifts with you, always. Tree Spirit Whisperer 3 – Watch for signs. Druid – As you walk along the path, consider what you see. Tree Spirit Whisperer 1 – See the divine wisdom in all in yourself. Tree Spirit Whisperer 2 – Feel the magic and creativeness through your being. The culminating moment from this exercise was a provision of space for each of us to declare what we found to be the true spirit of our seed group and how we can recognize the Spirit of Coll in others. By this time there was a palpable shift in the air and in our own regard for the Spirit of Coll and for ourselves that lingered on even after the Circle was opened and as we gradually plodded our way back into the apparent world. Our 2014 Retreat had been successfully carried out, and for two and a half days, it was the preoccupation of 20 people with an enthusiasm for Druidry. We seemingly had fulfilled our thematic objective of evoking the Spirit of Coll in our work and in ourselves. This endeavor evolves and continues on as we grow together as a Seed Group in the light of our own individual spirits and creativity and under the sheltering limbs of our distinguished Order. Thank you OBOD, for giving us these opportunities to grow and go along the Path. If you would like more information about the Circle of Coll, please visit our web site http://circleofcoll.org . Please feel free visit the Circle of Coll Facebook group at: https://www.facebook.com/groups/circleofcoll/. 2013 marked the Circle of Coll’s seventh year, and as we look back through the months, we see a very active calendar with traditional CoC gatherings as well as new activities, collaborations, and outreach opportunities that could continue on into 2014 and beyond. We started the year in Ravenna Park joining EarthCorps, Seattle Green Partnership, and Seattle Parks and Recreation, removing invasive plants and preparing planting sites. Our Herb of the Month series continued on with unique group studies of Ferns and Cedar, and we accompanied the Grove of the Scarlet Oaks in bidding a blessed farewell to the pair of trees for which the newly formed OBOD grove is named. Sadly, the twin oaks were removed to make way for a construction project. Other new activities for the Circle included an implementation of the Sharing Circle which gave us all opportunities to dive more deeply into our relationships with the Circle of Coll and with each other. We also reached out to the Interfaith Community by facilitating a very special Celebration of the Sun Ceremony for the members of the Interfaith Community Sanctuary and School where we gifted and planted a young oak on the grounds. A new series called the Stone of the Month was launched in 2013 that provides space for the study of sacred minerals and gems. The first session featured the mystical Blue Stones of Stonehenge, and we eagerly look forward to more of these gatherings in 2014. Also new to our events list was “The Bard’s Tent” that we co-created with the help of the Bards of Caer Pugetia and the Order of the White Oak, for the Tacoma and the Seattle Scottish Highland Games. This was our foray into the “Games Circuit” where we tended a society tent providing reading materials, stories, conversation, and general information about Druidry. It was a grand success as we met lots of interesting and curious people, and we will no doubt be asked back to do it again this year. 2013 has been the year for partnerships with the Circle of Coll. It was an honor to be invited by the Airway Heights Corrections Center near Spokane, WA to facilitate a ceremony and workshop for the OBOD members who are incarcerated there. We developed an Alban Arthan ritual especially for the residents of AHCC as well as a workshop entitled Finding the Light of Arthur Within. Permission to enter a corrections facility would have been a first for the Circle of Coll, but unfortunately, a severe snow storm that covered much of Washington State prevented us from traveling to the remote location in person. Instead, we forwarded the ritual script and workshop outline to the chaplain who enlisted a local Druid to assist with the events. We hope that this will be the beginning of a partnership between CoC and AHCC and we are planning another ceremony and workshop for the spring. Our traditional activities such as the Druid Socials, Hedge School Workshops, Tree Walks and Quarterly Healing Rituals continued throughout the year. One very special healing ritual aligned with the annual Concentric Circles event sponsored by the Our Lady of the Earth and Sky Church and with, in particular, the Warrior’s Call. This global plea was heralded by OBOD to all Seed Groups and Groves requesting that we send energy and healing to the sacred sites in the UK that are currently being threatened by fracking and other endangerments to our Earth. We, of course, heard the call and gladly focused our healing intentions toward this cause. 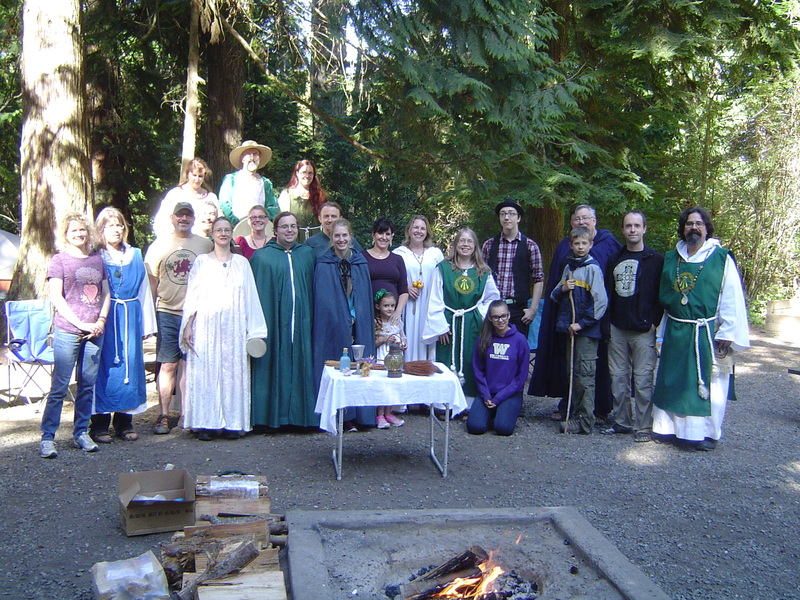 The theme of our Druid Retreat for 2013 was “Encountering the Greenwood” which featured a Forest Walk through the beautiful grounds at Mosswood Hollow, a Fire Procession, chanting, meditation workshops, an Eisteddfod, and a masquerade. As usual, the Circle of Coll celebrated all eight Festivals of the Wheel. Our Alban Hefin festivities included a Summer Solstice picnic at Carkeek Park and a Celtic Literary Reading Circle, spotlighting the Vita Merlini (Life of Merlin) written in the 12th century by Geoffrey of Monmouth. At Alban Arthan we invited each participant to commence his or her own internal Grail Quest that will be referenced in the coming months at future rituals. In addition to the tending of our many scheduled events, the Circle of Coll has been ebbing and flowing like the tides, with growth and contraction while we fondly remember former members, get to know new faces, and become familiar with our recently revitalized charter. A new Council of Three is in place as well as new Stewards, committee members and officers. A year of further spiritual growth and evolution lay before us as we eagerly welcome the changes and traditions ahead in 2014. If you would like more information about the Circle of Coll, please visit our web siteÂ http://circleofcoll.org . Also, please feel free visit the Circle of Coll Facebook group at: https://www.facebook.com/groups/circleofcoll/ . May the light of the inner sun shine on our path. May the sun that is the source of all life bless us, our families, people and land. Let light flow from this place and time to every radiant, hoping heart, and to all the lands and peoples of the earth, her lakes and seas, her mountains and her caves; her deserts and her forests. May all beings on earth be strengthened by this light. We give thanks to the sun for its blessings of light and of life. As you anticipate summer and the coming of the Longest Day, for what do you give thanks to the sun this year? Leave a comment on this blog and let us know!